We were delighted to be awarded the MedTech Partner / Supplier of the Year finalist recognition at the 2018 Medtech Rising Event. It was a great honour to be in the top three for this prestigious award. 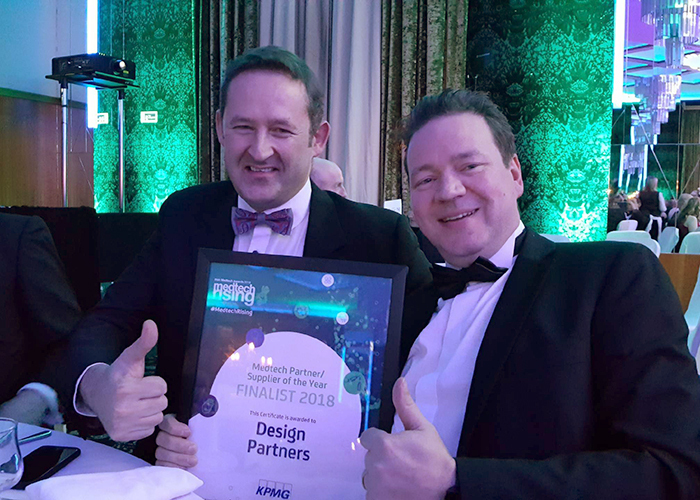 Design Partners are delighted to be among the finalists for the Irish Med Tech Awards. The Irish Medtech Association, the Ibec group that represents the medtech sector, with Enterprise Ireland and IDA Ireland today announced the finalists for The Irish Medtech Awards 2018 which will be held 6 December, in Rochestown Park Hotel Cork. "I want to congratulate these innovation trailblazers who have been shortlisted." Press release sourced from Irish MedTech Association images sourced from medtech rising.